Suggested ticket donation is $20 per person, but you can donate any amount, and it will go directly to YoungLife non for profit program in Truckee Ca. 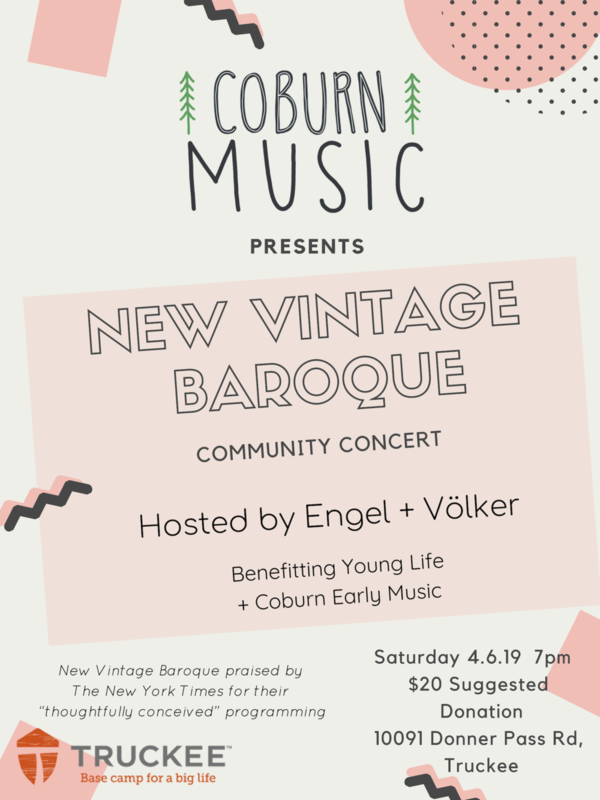 New Vintage Baroque comes to you from NYC as the ensemble in residence at the University of Nevada, Reno to present an evening of early music spanning the 14th-18th century. Love can be painful, full of disdain and even dangerous... What happens when someone swears to accept the torture with the passion, even if it means death? NVB drops you into the heart of the medieval period with the courtly music of Machaut with a playful courtship and an ominous oath of love. Lute songs then draw you into the renaissance period describing the perfect union and its regretful fade. Songs of the Baroque pave the way for the ill fated lovers to an end youll have to come and see! This concert has been made possible in part by the support from Truckee.com Base Camp for Big Life. A portion of the ticket proceeds will benefit YoungLife after school youth program in Truckee, CA.